Home | Serigraphs and Giclee Fine Art | Kerry Hallam | Kerry Hallam Limited Edition Hand-Pulled Serigraph on Canvas: " Villa di Mare (La Dolce Vita) "
Kerry Hallam Limited Edition Hand-Pulled Serigraph on Canvas: " Villa di Mare (La Dolce Vita) "
Image Dimensions: 18" x 22"
About the Art: Kerry Hallam, Villa di Mare (La Dolce Vita), Suite of four hand-pulled serigraph on canvas, canvas size: 18 x 22 inches. Signed by the artist and numbered. 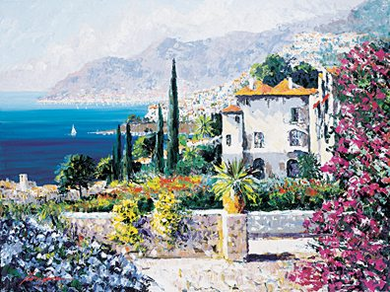 Home | Fine Art Prints & Limited Editions | Gallery Direct Art is your Authorized Chalk & Vermilion Dealer | Kerry Hallam | Kerry Hallam Limited Edition Hand-Pulled Serigraph on Canvas: " Villa di Mare (La Dolce Vita) "